While Foursquare has evolved over the last two years to become more of a local search and recommendation engine with its Explore feature, the benefits have been limited to logged-in users, first on mobile and then on the desktop website. Now Foursquare wants to become an open local search tool with a redesigned desktop home page that allows non-members to search for local listings and get recommendations on nearby restaurants, bars and businesses. Web users who visit Foursquare.com later on Monday will get the ability to use Foursquare’s Explore search tool without logging in, just like anyone can use Yelp (s yelp) or Google (s goog), the company confirmed following an earlier report by Greg Sterling. That’s who Foursquare will be competing with as it grows into a local search engine, part of Foursquare’s overall transformation from a location-based game to a data-driven local resource. Previously, Foursquare built Explore recommendations for users based on their check-in activity and those of their friends. But with almost 3 billion check-ins and 30 million tips, Foursquare now believes it can provide helpful and relevant recommendation and search results for anyone, even if they’ve never checked in. That’s important because not everyone likes checking in. Foursquare will look at what’s popular in a particular area, what’s trending, where experienced users go and what’s popular based on the time of day and week. Foursquare will tap its tips data to steer people to particular menu and product items that are mentioned a lot. There’s still an incentive to sign up: Foursquare members will have more tools at their disposal such as filters for finding new places, places that friends have been to and places with specials. The filters will still appear for non-members but if clicked, they will prompt a visitor to download Foursquare’s mobile app. But Crowley said opening Foursquare.com benefits a much wider audience. It recently partnered with Open Table to make it easy for people to make reservations from Foursquare. And it shows how Foursquare is poised to become a potentially profitable company. As we discussed earlier, Foursquare is seeing good early results with its first advertising product called promoted updates for mobile users. But as it opens up, Foursquare can target a much wider audience beyond its current 25 million members. It won’t have as much data on these users but it can still understand a lot of user intent and that’s valuable to local advertisers since local searches often lead to purchases. Foursquare told FastCompany that 20 percent of people who search for places on Foursquare end up checking in there within three days. That could lead Foursquare to create an AdWords-like product for the desktop website that could compete more with Google. It’s still early in the evolution for Foursquare and it’s clear that the service has to battle some older notions about its emphasis on games and check-ins. But with the new open approach to the home page, which will probably be repeated on the mobile apps at some point, Foursquare is showing it can be a powerful local search engine. How to can doWnload this aplication ?? susane – go to application. press download. So now they’re competing directly with Google and Yelp. 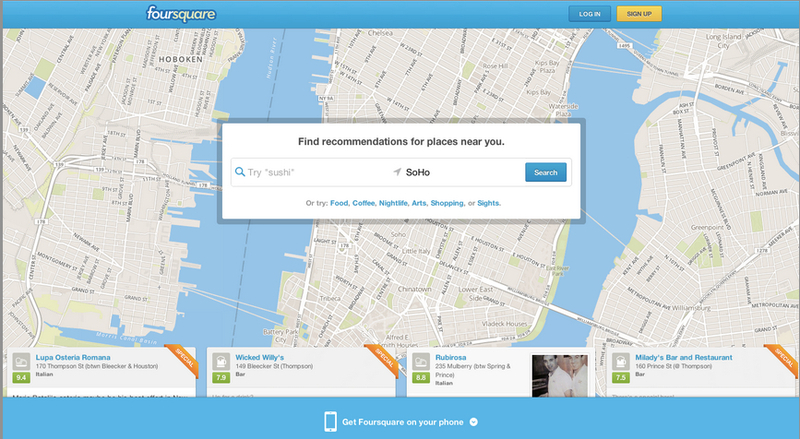 While 4SQ does have some good data from all of those check-ins and tips, I’d much rather be in Google’s or Yelp’s shoes.